Material: Optic Crystal Base, Art Glass Top. This exclusive award represents synergy of two forces joining together in fruitful collaboration. "Synergy is the highest activity of life; it creates new untapped alternatives; it values and exploits the mental, emotional, and psychological differences between people." Stephen Covey. 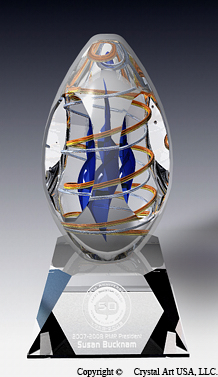 The award is composed of a hand crafted art glass sphere set atop of a clear optic crystal base.